Flame Resistant Clothing features lightweight design. Made of 5.3 oz GlenGuardÂ® fabric, WorkriteÂ® FR Line offers arc thermal performance value of 9.5 cal/cmÂ² and is UL certified to NFPA 2112. Line includes coveralls, shirts, and pants in variety of colors. In addition to FR protection and comfortable, lightweight design, garments provide moisture management, durability, and colorfastness. OXNARD, Calif., – Workrite Uniform Company, Inc.®, a flame-resistant (FR) clothing manufacturer, announces the launch of a Workrite® FR product line featuring 5.3-ounce GlenGuard® fabric. The new Workrite FR GlenGuard 5.3 line offers one of the lightest weight Category 2 fabrics currently available on the FR clothing market. Produced by Glen Raven, the GlenGuard fabric offers an arc thermal performance value (ATPV) of 9.5 cal/cm(2), and is UL certified to NFPA 2112. This new Workrite FR GlenGuard 5.3 line aims to increase wearer compliance by providing an unprecedented level of comfort and protection. "Unfortunately, some FR garments can be heavy or cumbersome, prompting workers to increase their comfort level by rolling up their sleeves or untucking their shirts -- exposing them to greater risk or injury," said Mark Saner, Workrite Uniform technical manager. "Our new GlenGuard 5.3 line represents a breakthrough in comfort that maximizes worker safety by offering an FR clothing option that workers want to wear and wear properly." The new Workrite® FR line includes coveralls, shirts and pants in a variety of colors -- all featuring the 5.3-ounce GlenGuard fabric. In addition to FR protection and comfortable, lightweight fabric, the garments also offer moisture management, durability and exceptional colorfastness -- a hallmark of GlenGuard fabrics. All Workrite FR GlenGuard 5.3 products are now available for business-to-business (B2B) purchase in the United States. Workrite Uniform Company, a B2B affiliate of Williamson-Dickie Manufacturing Company, also offers a variety of other FR apparel through its brands: Workrite FR, Walls® FR, Dickies® FR and Workrite® Fire Service. 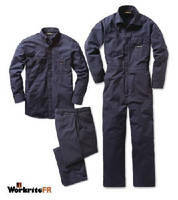 For more information on the GlenGuard 5.3 line or other Workrite Uniform offerings, visit Workrite.com. Workrite Uniform is a business-to-business (B2B) affiliate of Williamson-Dickie Manufacturing Company ("Dickies"), a global workwear brand. Founded in 1973, Workrite Uniform Company, Inc. has delivered high-quality flame-resistant (FR) workwear for more than 40 years. They are also the leading supplier of FR station wear for fire service. An ISO 9001:2008-certified company, Workrite Uniform is solely focused on the development and manufacturing of FR clothing for industries throughout North America. Today, Workrite Uniform offers three top-quality FR brands, Workrite® FR, Dickies® FR and Walls® FR, in the B2B market. For more information on Workrite Uniform, visit www.workrite.com.